Perhaps you have a portfolio, but it’s out-dated, embarrassing to show and you can’t motivate yourself to redo it. If you’re suffering from “portfolio creator’s block,” there are a few easy-to-remember steps you can take to jump over this hurdle and hopefully start you on a path for your next great UX job! The most important concept to keep in mind is to let things go. As designers, we often get attached to our work because we put a lot of time, energy and creativity into it. This also goes for portfolios because they are very personal to us. There’s also a lot of pressure to have them reflect our skills and talents, so we think they have to be perfect. However, being this attached is one of the biggest hurdles that prevent us from actually creating our portfolios. 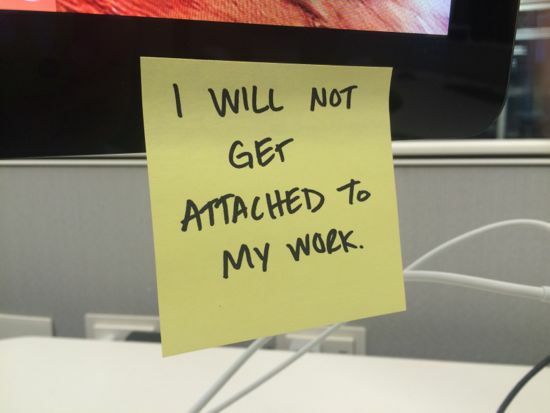 So while creating your portfolio, tell yourself, “I will not get attached to my work.” Write it on a sticky note and make it your mantra as you work on your portfolio. Also remind yourself that you constantly iterate upon ideas for work projects, so designing and creating your portfolio should be an iterative process, too. While your portfolio is one of your most personal projects, it’s just that – a project. Leverage your UX skills to conceive, sketch, wireframe, and design your portfolio. In your portfolio, include any relevant projects that show your process from start to finish. 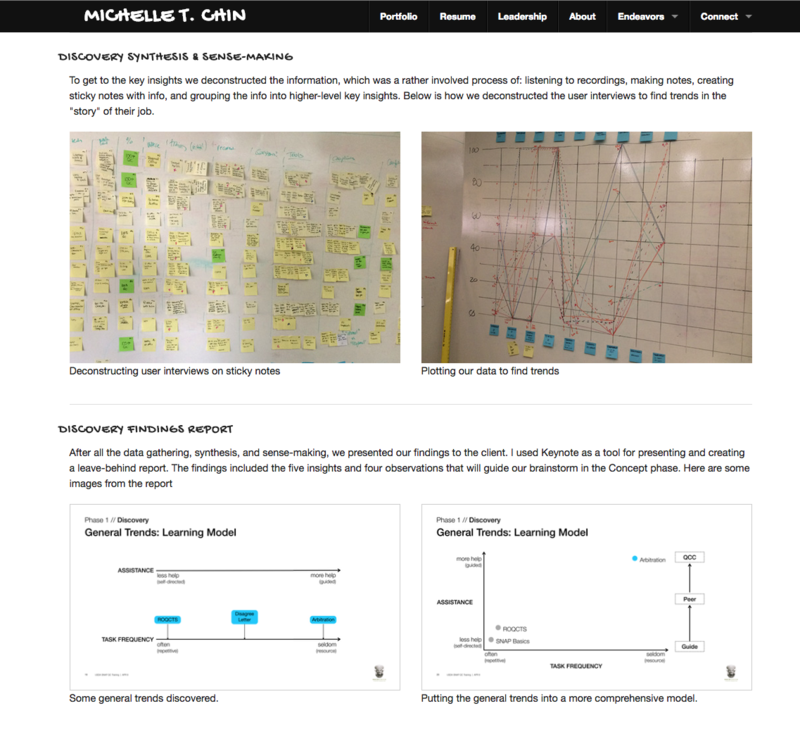 UX portfolio pieces should show the project’s challenges and the thought process behind the solutions. The thinking behind a project’s work isn’t always evident in the final product, so include any whiteboard sketches, drawings or wireframes that you’ve created along the way. When determining how many pieces to put in your portfolio, consider how busy hiring managers are and how many other portfolios they’re skimming. When screening for candidates, most recruiters and hiring managers are pouring through resumes and quickly glance through portfolios. Make sure you only include your BEST work and that each piece can strongly convey your skills alone – just in case the reviewer only has time to look at one piece. Keynote, or coding it from scratch. Regardless of how everyone else is doing it, choose an option that’s best for you. Use a tool that you’re comfortable with and one that works within your timeframe. If you’re rusty on coding, creating a site from scratch isn’t the best option. Creating a portfolio is already enough work, so avoid adding more to your plate. There’s nothing wrong with creating a PowerPoint or PDF version of your portfolio and posting it on a service like Speaker Deck. Following these easy-to-remember steps can help you get over portfolio creator’s block, but it’s not to say that creating your portfolio will be smooth sailing. As with any project, it takes a lot of effort, but by leveraging your skills, not getting attached to your work and using what works best for you, things should be more manageable. And once you’re done creating your portfolio and scoring your next awesome UX job, do yourself the biggest favour possible. Maintain it. Making small tweaks, swapping one project out for another, and so on is much easier to do than completely overhauling your portfolio. Unique ideas Michelle, thanks for all of them. I am only at initial phase of my career. Started my first job as designer last year after a formal web and UX designing training. I am really excited in creating my little portfolio with couple of my works, I did till date. I love Behance and always keep my works posted there. As you said, we can use PPTs to make our portfolio, I would also love to create some interactive HD videos from PPTs. Enjoyed reading these tips and ideas. Thanks for sharing them with us.